Ferreira (2007, p. 20) point out many authors have similar definitions about vocabulary. 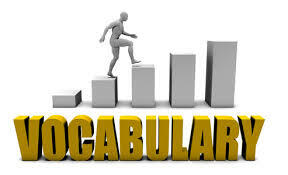 Vocabulary can be defined as a powerful carrier of meaning and the knowledge of words and their meanings. This means that without establishing a strong vocabulary base first, comprehension and use of a language will not be achieved. In addition, the student should be able to recognize words, and know their meanings as well. Thus, when a student is effectively able to recognize and use a word in different contexts, speak, write, pronounce the word well, she/he has the knowledge and meaning of that word. Vocabulary can be defined as “the words we must know to communicate effectively: words in speaking (expressive vocabulary) and words in listening (receptive vocabulary)” an extensive body of research exists on teaching and learning vocabulary. Holmes (1918, p. 34) Vocabulary is the words you have to know to read a story, secondary students might define vocabulary as a list of words given by the teacher in order to comprehend a given text. Vocabulary is stored information about the meanings and pronunciations of words necessary for communication. Sedita (2005, p. 33-45) Vocabulary is one of five core components of reading instruction that are essential to successfully teach children how to read. These core components include phonemic awareness, phonics and word study, fluency, vocabulary, and comprehension Vocabulary knowledge is important because it encompasses all the words we must know to access our background knowledge, express our ideas and communicate effectively, and learn about new concepts. Vocabulary is one of the important elements in building up English using this element, someone can communicate, learning and thinking. Therefore, the learning of vocabulary is fundamental need to support some learners to master English, because the ability of students to read and to comprehend the subject is relatively detemined by their vocabulary. Ferreira (2007, p. 20) The knowledge of word meanings and the ability to access that knowledge efficiently are recognized as important factors in reading and listening comprehension, speaking and writing fluency. Thus, vocabulary knowledge helps students with language comprehension. Vocabulary knowledge is the heart of a language comprehension and use. Comprehend a text successfully students need to have sufficient word knowledge. This is to say that the comprehension of a language depends on the amount of words that are known in that language. Vocabulary is an essential component of language learning. As stated above vocabulary is the words which have meanings and functions of a language being learned, thought or used in daily conversation so that they become part of today's living language. Learning English means learn four language skills namely listening and reading as receptive skills while writing and speaking as productive skills. That is why we classify vocabulary into two types. They are receptive and productive vocabulary. Receptive vocabulary refers to the words which can be recognized and comprehended in the context of listening and reading, while productive vocabulary refers to the words which we recall and use appropriately in writing and speaking. Vocabulary teaching and learning is central to the theory and particle of ELT, words have a central place in culture and many as the main task in learning another language is learning words. Interest in vocabulary from researcher teachers and research is likely continued to grow apace. The professional teacher active learning will improve the teaching of vocabulary. The following questions are constantly asked by teachers and students when teaching and learning vocabulary. - How many words provide a working vocabulary in foreign language? - What are the best words to learn first? - Are some words more difficult to learn than the others? 1) Active vocabulary refers to words that students have learned which they expect to be able to use. 2) Passive vocabulary refers to the words which students will recognize when they meet them but which they will probably not to be able to produce. 1) Active. These are words one customarily uses in speaking active vocabulary probably runs from 5.000 to 10.000 words. 3) Passive. The words one recognizes vaguely but is not sure of the meanings. He never uses them in either writing or speech. Belum ada tanggapan untuk "The Concept of Vocabulary"